​This OLIMEDICS branded brain formula is designed to bring you the benefits of advanced nutritional science in convenient tablets. 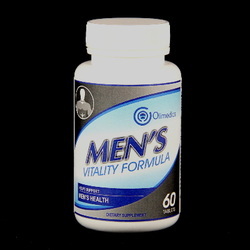 This is a male enhancement formula specifically designed to support men’s health. 2 tablets daily preferably with meals or as directed by a healthcare professional. Zinc (oxide), Tongkat Ali Root, Maca, L-Arginine, Panax Ginseng Extract, Eleutherococcus senticosus, Sarsaparilla, Pumpkin Seed, Muira Puama, Oat Straw, Nettle Leaf, Cayenne Pepper, Astragalus, Catauba Bark, Tribulus Terrestris, Orchic, Boron 5% (amino acid chelate), Oyster Extract, and Licorice. Other Ingredients: Maltodextrin, cellulose, vegetable stearic acid, croscarmellose sodium, povidone, pharmaceutical glaze, silicon dioxide and vegetable magnesium stearate.